So it’s safe to say that the game experience will be entirely different, isn’t it? In terms of presentation. Were there many challenges? Ishihara: Since we’re putting Pikachu and Eevee in the title of the games, we are really focusing on creating the feeling of adventuring together with these two creatures and make them seem alive to the furthest extent possible. For instance, how they climb onto your shoulder or how they come closer when you pet them, so that you can really get the sense of them being there with you. I think this is one of the benefits of having a home console where you can display something on a big screen. Of course, that means that we’re aiming for something closer to what you see in the anime, rather than the impressive show of strengths you see in Pokemon Battle Revolution. There have been many games such as Detective Pikachu and Hey You, Pikachu! where you’ve been able to connect with Pokemon, but we are doing our best to make this the ultimate way to experience the charming Pikachu and Eevee through movement, voice, and cuteness. Maybe this will make me sound paranoid, but if the game design changes drastically, won’t we lose some of what makes Pokemon what it is? Ishihara: Amongst those who have played the game, there may be some who feel like it has changed. However, we’ve actually been continuously changing the formula for the games since the beginning and in the end the players have accepted those changes. Along those lines, this time we are also changing things around, but that’s part of the long standing tradition of Game Freak and the Pokemon series. We won’t make mistakes with the basics, so please trust us. So basically the new game also builds on the foundation of the Pokemon series? Ishihara: Yes. And on top of that it adds new functionality like being able to connect to Pokemon GO. Speaking of connectivity to Pokemon GO, can you give us more details about the implementation? Even for Niantic, that might’ve been a surprise request [laughter]. Let’s remove some the mystery [laughter]. What can users expect from the Poke Ball Plus and what type of device is it? Ishihara: To put it simply, it’s the ultimate Poke Ball. I told the Nintendo team that I wanted to improve upon Pokemon GO Plus, and they responded with, “If we’re going to go that far, we want to make the Ultimate Poke Ball”. That’s where development began, taking into consideration things like how the back of a Poke Ball should be textured, how the button on a Poke Ball should feel when pressed, movement, and the cries of the Pokemon themselves as well as how the Pokemon should respond when you take them for a walk with the device, creating something unprecedented. We ended up deciding that on top of that, we wanted the Poke Ball Plus to also work similar to a Joy-Con when paired with Pokemon: Let’s Go, Pikachu and Pokemon: Let’s Go, Eevee. At the same time, it’s both a Poke Ball that you can take your Pokemon for a walk in, but also a controller for the Nintendo Switch as well as a ‘Pokemon GO Plus’ when connected to your smartphone, so it has a lot of functionality! That really is the Ultimate Poke Ball. Lots of people have been asking that question on many different platforms but I wondered if it was really OK for it to remain like that. What would happen if you could deposit your Pokemon ‘in the cloud’, similar to the Pokemon Bank and take them with you whenever you wanted. The feeling that that was the future of Pokemon is what let to the development of the Poke Ball Plus. At first I wanted to expand existing features a bit and make a device that would you the the feeling of holding a Pokemon in your hand. However, rather than what I had in mind, Nintendo suggested the concept of the ‘Ultimate Poke Ball’ and the ability to use it as a Joy-Con, hence it became what it is now. Some features are the same as the Pokemon GO Plus, but there are many new experiences built in as well, so I’d like people who already have a Pokemon GO plus to try this as well. I imagine that it all began with experimenting on how to connect the Nintendo Switch and smartphones. I think that this will be an important feature for future IPs as well. Can you give us your thoughts on that possibility? Ishihara: For now, I see this as as exclusive feature to Pokemon: Let’s Go, Pikachu and Pokemon: Let’s Go, Eevee. It’s true that we achieved connectivity between the two devices [Nintendo Switch and smartphones], but I don’t think that will be a standard feature from here on. In other words, feeling like you are playing with similar Pokemon even in different games is something that’s mainly possible because it is a Pokemon game in the first place. Ishihara: Exactly. 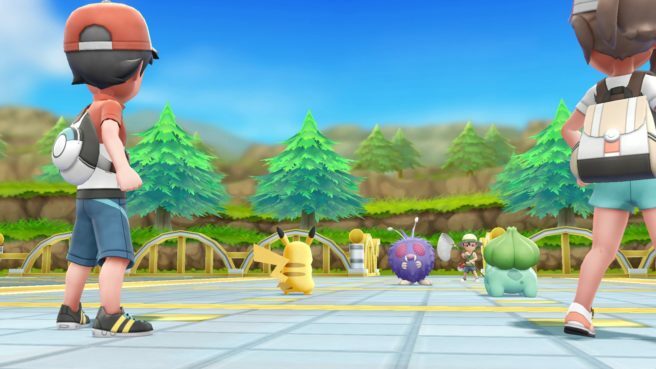 However, in Pokemon GO, the aim is to collect Pokemon whereas in other games the aim is to raise and battle them, so the game balance changes a lot. Deciding what parts of those games to have cross compatibility between was a big challenge for Game Freak. Until this point the balance had been maintained by not having that functionality. By allowing this functionality now, it definitely created new challenges. The game launches on November 16, but how are you feeling about it currently? Ishihara: Being able to return to the Kanto region… It’s nostalgic, but in terms of play style, it’s similar to Pokemon GO and the facial expressions of the characters that appear and the look of the place itself have become a lot ‘richer’ so it feel new. It’s a combination of nostalgia and freshness. One thing that we’d really like to know… Will any completely new Pokemon appear? Ishihara: It feels like they might! The game is set in the Kanto region so some people might look at it like a remake of Pokemon Yellow but…We are planning to add new elements including Pokemon that you see for the first time. You also announced Pokemon Quest during the May 30th announcement. The square art style really draws attention to itself. What were your thoughts the first time you saw the art style? Ishihara: Actually trying the game though, it turned out to be a lot of fun! They’ve managed to translate all the feelings and expressions of the Pokemon from Pokemon Red, Blue, Green, and Yellow into something square. [laughter]. There’s a strange persuasiveness to the square Pikachu design that makes me feel like “yes, this is indeed Pikachu”. Is there a design from Pokemon Quest that you particularly like? Ishihara: Apart from Pikachu it’s Gyarados. Pokemon also have traits, however. If you look at Squirtle, Bulbasaur and Charmander from above, it’s hard to tell them apart except for by color, but when you see them perform their moves it gets easier. The reason we can get away with changing their looks so much is that everyone is already familiar with the Pokemon from Pokemon Red and Green. If you did the same with Necrozma or Guzzlord they might be really hard to recognize. If you look at this super deformed style in its own merit, it’s quite fun and I think it’s enjoyable to try this brand new way of raising Pokemon as well. I also think that people who have played Pokemon GO will be able to recognize the Pokemon from Pokemon Red & Green so it should be easy for them to play as well! True. And it makes a big difference that it’s on the smartphone as well. Ishihara: I look forward to finding out how much people will play this on their phones and for those players who will play this on their Nintendo Switch, it’s a sort of game that we haven’t really seen in the past. Hopefully that means that a lot of people will give it a chance.